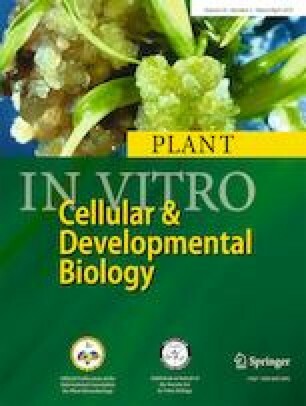 Strong allelopathic activities of etiolated seedlings of a leguminous plant, Vicia villosa Roth (hairy vetch), were confirmed by a protoplast co-culture method. The combination of 1% Cellulase RS and 1% Driselase 20 in 0.4 M mannitol solution was used for protoplast isolation. The inhibitory effects of V. villosa protoplasts on the growth of recipient Lactuca sativa L. (lettuce) protoplasts were determined using 96-well culture plates with 50 μL of liquid medium consisting of Murashige and Skoog’s basal medium containing 1 μM 2,4-dichlorophenoxyacetic acid, 0.1 μM 6-benzyladenine, 3% (w/v) sucrose, and 0.4 M mannitol in each well. The allelopathic activity of V. villosa epicotyl protoplasts (2 × 102 to 105 mL−1), on cell division of lettuce protoplasts (6 × 103 to 5 × 104 mL−1), was stronger than that of roots and was stronger than on cell wall formation. Digital image analysis of co-cultured protoplasts (DIA-PP method) showed the effect of V. villosa protoplasts on the accumulation of a yellow color in lettuce protoplasts. Weaker inhibition was seen than at the cell wall formation and cell division stages. Effects of putative allelochemical, canavanine at 10 μM strongly inhibited division of lettuce protoplasts, whereas putative allelochemical, cyanamide was stimulatory at 10 μM, but inhibitory at 1 mM. A high level of canavanine was found in epicotyl protoplasts using gas chromatography-mass spectrometry. Canavanine was suggested to be the allelochemical in V. villosa epicotyl protoplasts of etiolated seedlings, although its effect differed with the growth stages of lettuce protoplasts. This work was partly supported by JST CREST Grant Number JPMJCR17O2 and JSPS KAKENHI Grant Number 26304024 to Y. F.